Earth Day events have expanded beyond just a single day. April 22nd has morphed since the original Earth Day in 1970 into a quasi Earth Month. Eventually, I predict, this special day will transform completely into an Earth ForeverAfter Epoch. The time of a willful denial of our life-support system will be but a dismal parenthesis in our otherwise stellar existence. 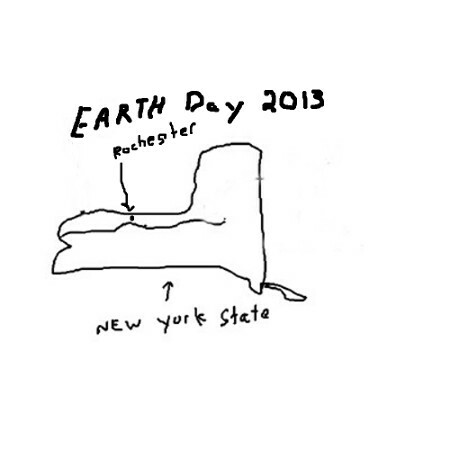 We’ll practice Earth Day every day. Or, we’ll perish. 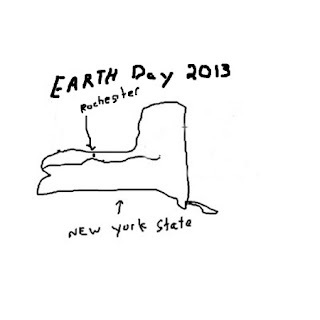 In and around the Rochester, NY region (I’ve included our friends in Buffalo and Syracuse) we are noticing more and more environmental events coalescing around early spring. This means many individuals, groups, schools, businesses, and governmental institutions are stepping up to the plate on taking responsibility for our planet by educating their communities and spearheading environmental actions. Find out about our Energy future at the Ninth Annual SYMPOSIUM ON ENERGY in the 21st CENTURY; find out about Water Quality issues at the Sierra Club’s 15th Annual Environmental Forum “Great Lakes Need Great Friends: Protecting the Great Lakes Forever; find out about Wildlife at The Butterflies of the Genesee Land Trust; find out about Recycling at Buffalo’s Enviro-Fair; or learn about local Transportation solutions at the biannual Genesee-Finger Lakes Active Transportation Summit (G-FLATS) 2013. Also, celebrate Earth Day at Greenovation’s Earth Week Celebration. Or see how Tim DeChristopher’s Release from Prison Inspires Earth Day Theatrical Release of Bidder 70 , a Rochester experience of this nationwide Earth Day event. I’ve just been whetting your appetite; there are many more events, actions, and celebrations in our region. Find out about them here. While we celebrate progress on focusing humanity’s attention on our environment, we must realize that ad hoc progress on environmental health isn’t enough. We know more about our planet’s workings and plight than we did in the 1970’s. If the Climate Change crisis has done us any good at all, it has motivated scientists all over the planet to gather information about planetary temperatures and to learn in the process how Earth’s ecosystems work as a whole unit. We know that extreme weather events around the world are related to overall temperature rising. We are starting to think about and see our planet as a single entity of which humans are only one component. For example, in this NASA animation we can watch the Earth breathe. Industries and communities that are starved for water have learned how to conserve, measure, and analyze water use in ways inconceivable years ago (read The Big Thirst: the Secret and Turbulent Future of Water). With new information and technology we are starting to realize that we must act as one to solve this single problem. This year’s Earth Day should also be a revelation that lines have to be drawn on environmental abuse. Earth Day isn’t just about celebrating past successes and navel gazing about how wonderful things would be if we could just stop being our self-absorbed selves. It’s about setting benchmarks, reaching milestones, and creating lines that cannot be crossed if we are to survive. We must stop increasing greenhouse gases that are warming our planet too quickly for too many to adapt. In the past, we have stopped our rivers from burning, our lakes from dying, and pollution from being sent untreated into our drinking waters. Now, we must stop Fracking and increase renewable energy. We must stop the XL Keystone Pipeline, a fossil fuel resource conduit so dirty and polluting it may spell game over for all of us. We must become aware, all of us, not just a few of us. Take someone who has never been to an Earth Day event to one this Earth Day and increase the odds of our kid’s having an Earth Day of their own.